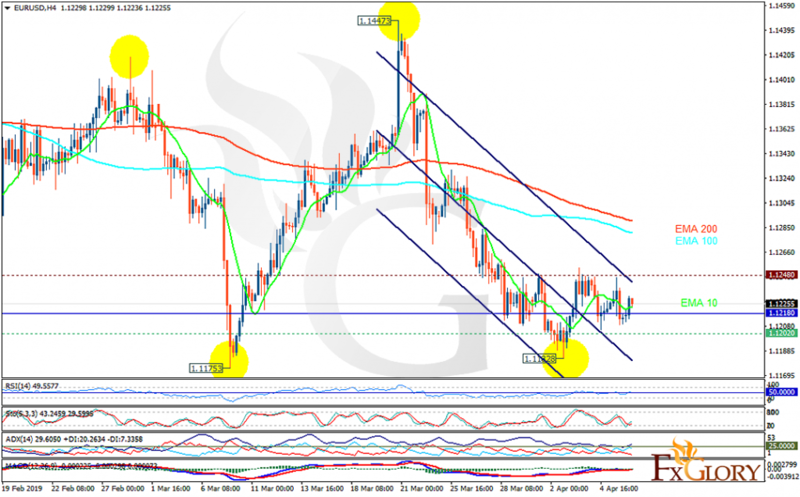 EUR is moving in low ranges against USD which is empowered by the US Nonfarm Payrolls. The support rests at 1.12020 with resistance at 1.12480 which the weekly pivot point at 1.12180 is located in between the lines. The EMA of 10 is moving horizontally in the descendant channel and it is below the EMA 100 and the EMA of 200. The RSI is moving on 50 level and the Stochastic is showing upward momentum. The MACD line is above the signal line in the positive territory. The ADX is showing buy signal. The resistance line seems to be too strong to be broken, EURUSD may continue its decline towards the support area at 1.12000.